Creating a Japanese inspired Bento Box or lunch is a fun way to use up your Christmas leftovers, as well as keep the Christmas spirit alive with kids after the big day. Here I've made Rudolph with brown rice onigiri and a cream cheese filled Pepperdew for his red nose. He is surrounded by omelette and ham parcels wrapped with chive ribbons. 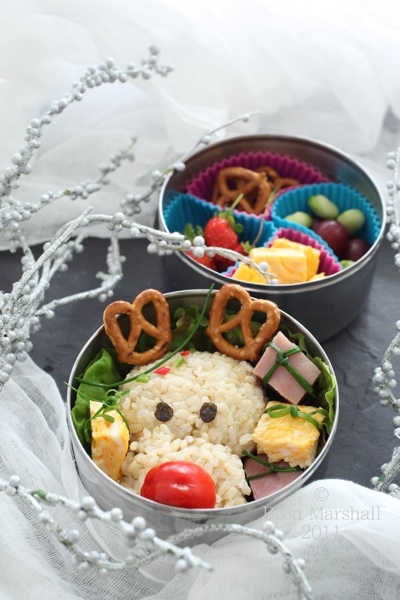 A quick web search is sure to give you plenty more ideas for Christmas themed Bento characters. You could try a simple snowman, Santa himself or perhaps a Christmas cat. Rinse the rice with plenty of cold water. Repeat rinsing and draining the rice until the water becomes clear. Drain the rice in a sieve or fine colander and set aside. Place the rice in a large heavy based saucepan and add the measured amount of water or liquid stock/broth. Let the rice soak in the liquid for at least 30 minutes, 1 hour is best. Cover the pan with a tight fitting lid and bring to the boil over a high heat. Turn the heat down very low, so that the liquid is barely simmering and cook for 15 to 20 minutes or until all the liquid has been absorbed. Try to lift the lid briefly and check only once or twice to prevent too much steam from escaping. Extra Tips: If you find the saucepan continues to boil too rapidly, lower the heat further or as far as you possibly can. Alternatively if possible elevate the saucepan further from the heat source. There may even be enough heat remaining in the saucepan with the burner switched off. Remove the pan from the heat, keep it covered and let it continue to steam within itself for 15-20 minutes. Fluff the rice with a fork or wooden Japanese rice paddle. Cover the rice with a clean tea towel and the saucepan lid and allow to cool until you are ready to create the Onigiri for your Bento. Shape portions of rice into Christmas characters and garnish as desired with your choice of toppings. All content and images copyright © 2005 - 2012 Bron Marshall.